Milan Baranyk opened the scoring for Phantoms in Swindon. 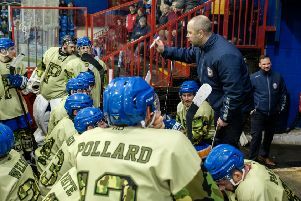 Peterborough Phantoms coach Slava Koulikov admitted special teams were the difference as his side tasted away defeat for the first time in a month. The city side went down 4-3 at Swindon in the English Premier League last night (February 20) as they fell six points off the pace being set by table-toppers Basingstoke – themselves 4-1 winners against Sheffield. Phantoms emphatically outshot their hosts, but that wasn’t reflected in the scoreline as they conceded twice on powerplays before leaking a short-handed goal early in the third period. And that proved to be the undoing of a team only able to ice three of their imports after Czech ace Ales Padelek was hospitalised on Friday with an inflamed and infected elbow. Coach Slava Koulikov said: “It is never a great feeling to lose a game and it is more disappointing when having the chances to win it. “I wouldn’t say we outplayed Swindon, but there is no doubt we outshot them. We created a lot of opportunities, but we didn’t have that bit of luck on our side or quite enough desire in some cases. “We know Swindon have some deadly players and they showed that again. Their powerplay is one of the best around and their special teams were the difference in the game. “Being without ‘Paddy’ meant we had to shuffle things around and it is never easy to have an import missing. Phantoms hit the front at the Link Centre last night when Milan Baranyk struck the only goal of the opening session. But they found themselves behind little more than three minutes into the middle stanza as Tomasz Malasinski’s powerplay leveller was followed by a Jonas Hoog effort for the hosts. Phantoms levelled on a numerical advantage of their own when Scott Robson’s shot was deflected past Wildcats netminder Stevie Lyle, but they were in arrears again when Hoog made another home powerplay count when an Aaron Nell shot fell perfectly into his path. The decisive moment of the game arrived 63 seconds into the third period when Swindon player-coach Nell broke clear and slammed the puck past Janis Auzins with his team a man down. Will Weldon did halve Phantoms’ arrears late on after Auzins had been pulled, but they couldn’t claw their way back onto level terms as their title hopes were dented. Phantoms entertain reigning champions Telford tonight (February 21) at Planet Ice (5.30pm).